What is meant by RO water purifier? How RO water purifiers work? What is meant by RO water purifier? The full form of RO is 'Reverse Osmosis'. 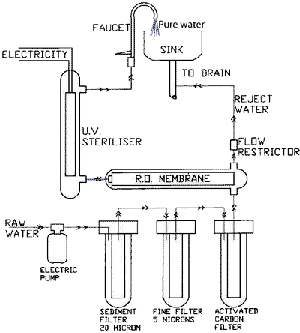 Reverse Osmosis uses RO membranes to purify water. An RO membrane is like a very, very fine cloth, so fine that it can filter out from water chemical molecules. 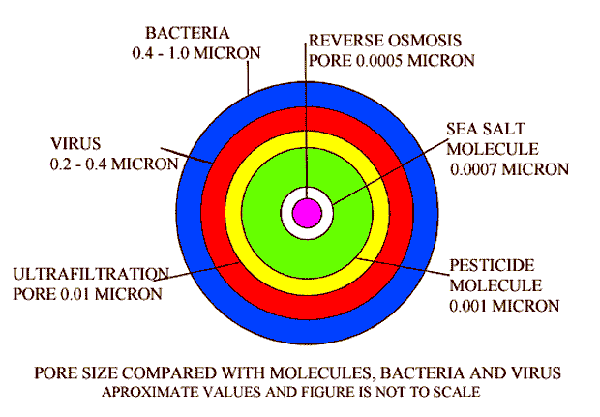 A molecule is at least a thousand times smaller than the smallest of viruses, bacteria, or any germ. So an RO water purifier not only removes all bacteria and virus from water but will also get rid of all poison chemicals like Heavy Metals, Pesticides, etc. An RO water purifier is the best type of water purifier for home use. The image below is used to explain what is RO Reverse Osmosis and how RO water purifier works. The holes or pores of an RO membrane, through which water is filtered out, is so small, that it traps not only the smallest of bacteria or virus but also blocks chemical molecules like that of salt. The RO pore size diagram below shows a graphical representation of the hole size of an RO Membrane compared with the size of common impurities in water. This helps us to understand how an RO water purifier works. RO membranes have very fine holes called pores, through which pure water molecules can flow through but will not allow larger molecules of salt to pass through. The diagram shows the size of the RO membrane pore in the centre as 0.0005 microns which is slightly larger than a water molecule, so water molecules pass through an RO membrane pore. Sodium Chloride molecule at 0.0007 micron is larger, and will not pass through the RO membrane pore. Germs, Viruses, and organic molecules which are very much larger than the RO pore cannot pass through the RO membrane pore. So when dirty water is kept under pressure on one side of the RO membrane, only pure water will pass through the RO membrane pore. Why an RO water purifier is required is because it is the best home water purifiers available. An RO water purifier can remove dissolved chemicals in water, which other types of water purifiers cannot remove. If ever the drinking water gets polluted with poisons like Arsenic, only an RO water purifier can get rid of it. An RO water purifier is also the most efficient in removing from water all bacteria and viruses. So the simple answer to the question 'Why RO water purifier is required?' is that it protects the user from all types of dangers in drinking water. Reverse Osmosis or RO is without doubt the best water purification system for home and it is being realised by people all over the world. No doubt that the price of RO water purifier is expensive, but it is really worth the money, it saves lives. To explain how RO works in water purifiers we have the flow diagram of a Reverse Osmosis RO water purifier. The RO water purifier flow diagram shows the several filtration stages which is there in an RO water purifier. There are several pre-treatment filtration stages in an RO water purifier before the RO membrane to protect it. These pre-treatment filters remove suspended particles and the activated carbon filter removes Chlorine, which can damage the RO membrane. In the RO flow diagram here, it shows a 5 stage RO water purifier. What is meant by stages in a RO water purifier is the number of water purification steps the water undergoes in a water purifier. In this diagram the first stage is the sediment filter of 20 microns, the second stage the fine filter of 5 microns, the third stage is the activated carbon filter, the fourth stage is the RO membrane and the fifth stage is the UV water purifier. Some RO water purifiers come with 6 or even 7 stages of water purification. The additional stage may be a second activated carbon filter containing a block activated carbon or Granular activated carbon. There could also be a remineralisation filter or taste enhancer stage at the end after the RO membrane. Food Industry: concentrate milk, orange juice, tomato juice, etc.. Main advantage of RO here is that the food is not heated and low operating cost. Pharmaceutical: In the manufacture of many medicines like Antibiotics, RO is used to concentrate the solution of Antibiotic obtained by fermentation prior to freeze drying to get antibiotics in powder form. Car Wash: The final rinse water in leading automatic car washing use RO water in the final rinse. This will leave a highly polished surface, since RO water will not leave any stains on drying. Waste water recycling: RO is being increasingly used to recycle waste water to potable or drinking water quality. Even sewage water is being recycled this way. Some countries have or are seriously thinking of increasing their fresh potable water supply this way, because waste water recycling is a cheaper option than sea water desalination.